Males and females have different color hair, like other Nomascus species. Adult male black, except for yellow/orange cheeks and slightly rusty-colored chest. Adult female pale yellow to orange-yellow. May have black crown. May have slightly darker chest. Infants born buff-yellow. Begin to transition to black coloration (same as adult males) at about six months old. Retain this coloration as juveniles and subadults. As adults, males retain black coloration. Females transition back to yellow upon reaching maturity. Southern Vietnam and eastern Cambodia. After taxonomic split with N. annamensis, no longer thought to inhabit Laos (Rawson et al. 2011; Thien et al. 2017). Wet evergreen and semi-evergreen forests. Mixed deciduous forest (especially where mixed with patches of evergreen forest), bamboo forests, and rattan (Old World palms) (Traeholt et al. 2005; Rawson et al. 2009; Chivers et al. 2013). Legally protected in Vietnam and Cambodia (Chivers et al. 2013). Population trend: decreasing (Geissmann et al. 2008; Rawson et al. 2011). Highest densities in undisturbed forests (Chivers et al. 2013; Vu et al. 2016). Cambodia (estimates missing from some regions): 450-1,350 groups (Chivers et al. 2013). Vietnam: Approximately 600 groups (see references in Bach et al. 2017), plus groups from non-surveyed areas; considered “common” (Traeholt et al. 2005). 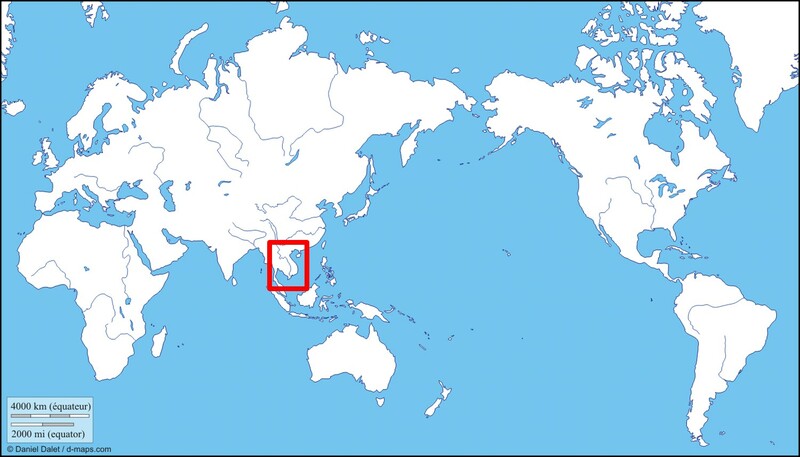 Cat Tien and Bu Gia Map National Parks support the largest N. gabriellae populations in Vietnam (Rawson et al. 2011). Hunting for wildlife trade. Mothers shot and infants traded for pet trade (e.g., Rawson et al. 2011). Also hunted for food (Geissmann et al. 2008; Rawson et al. 2011; Chivers et al. 2013) and traditional medicine (Rawson et al. 2009). Diurnal—active early morning until late afternoon (Chivers et al. 2013). After reaching sexual maturity, females disperse from natal territories to nearby territories. Males may disperse farther, if no space available in nearby territories. Territorial (Rawson et al. 2011). Family unit comprised of adult pair and offspring. Usually 4-5 individuals (range: 3-6) in a group (Kenyon et al. 2011); however, larger multi-female groups have been observed (Barca et al. 2016). Often loud calls around sunrise (Rawson 2004; Rawson et al. 2009). Adult male and female usually sing in duet (Geissmann 2002). Singing bouts about 12 minutes long (Rawson 2004). Immatures do not usually duet but occasionally call with group (Bartlett 2011). Mainly figs and other fruits; flowers, leaves, and shoots (Chivers et al. 2013; Bach et al. 2017). Also insects and bird eggs (Bach et al. 2017). Not well known. Pythons, leopards, birds of prey (eagles), large macaques (Bạch Thanh Hải, personal communication, 2018). Arboreal. Swing among tree branches from hand to hand (“brachiation”), climb, run on two feet, leap (Fleagle 1976). Shy around humans (Traeholt et al. 2005). Cryptic—difficult to observe in the wild (Barca et al. 2016). In southern Vietnam, held as pets in hotels and private zoos. Also hunted—see Threats to Survival (Rawson et al. 2011). Monogamous. Uncommonly, extrapair copulations (Kenyon et al. 2011) and multi-female groups (Barca et al. 2016). Not well known for Nomascus (Rawson et al. 2011). Among gibbons, generally, mature as early as 5 years in managed care and likely at 7-8 years in the wild (Geissmann 1991). About 21 days [data from 7 cycles of 2 females], similar to other gibbons (Geissmann and Anzenberger 2009). Not known. Likely similar to N. leucogenys, 200-212 days (about 7 months) (Geissmann 1991). One observation in N. gabriellae of 17-22 months (Chivers et al. 2013). Approximately 2-4 years in some other gibbons (Traeholt et al. 2005; see references in Bartlett 2011). Generally, gibbons weaned during second year (Bartlett 2011). How to cite: Red-cheeked Gibbon (Nomascus gabriellae) Fact Sheet. c2018. San Diego (CA): San Diego Zoo Global; [accessed YYYY Mmm dd]. 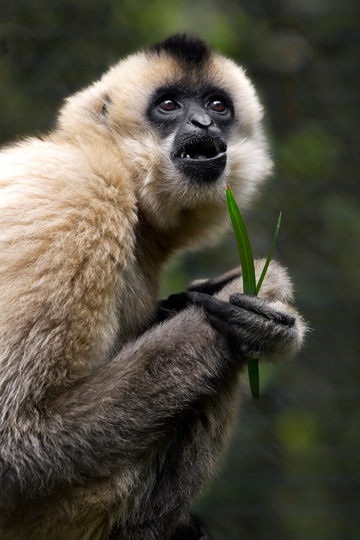 http://ielc.libguides.com/sdzg/factsheets/red-cheeked-gibbon. Both sexes begin life with buffy-yellow hair that changes to black as they become juveniles. In adulthood, males retain their black coloration, while females once again "go blonde." 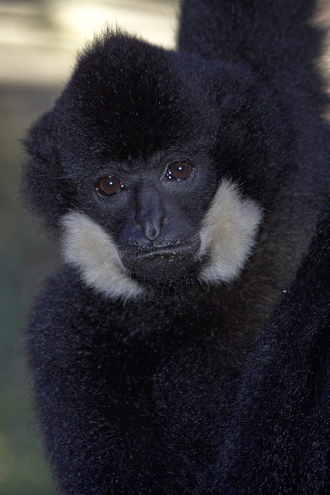 The red-cheeked (or southern yellow-cheeked crested) gibbon occurs in Cambodia and Vietnam.